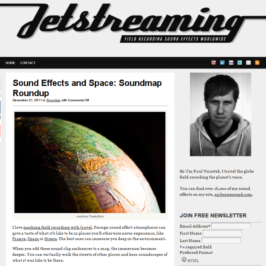 In the meantime, here’s a list of ‘mashup’ websites that combine maps and sound, called soundmaps. 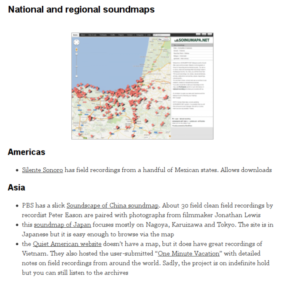 They use geotagging to position field recordings on a map. Some of them include soundwalks, which are field recordings while moving and exploring. La lista de sitios web ’mashup’ como acertadamente los llama Virostek, incluye muy interesantes proyectos fonográficos como SoundTransit, Radio Aporee Project y SoundCities entre otros. En verdad me place mucho encontrar en esa lista a Silente Sonoro.